It all started with the slime. For reasons I don't fully understand, my oldest daughter is obsessed with slime, which is why we now own a gallon jug of Elmer's glue, a box of Borax, and an infuriating Styrofoam-bead-like substance called floam. Despite receiving ample instruction about how and where slime should be made or played with -- hard surfaces only! not on the couch! not on the carpet! -- each of our three kids have gotten slime on various soft surfaces like the couch, the carpet, the new ottoman, and creatively, bedroom curtains. With each incident, I grew increasingly angry. I repeated phrases like, "You know better." I banned it for extended periods. Then, being more proactive and calmer, I coached them to use a plastic tablecloth. It's mostly worked. The girls are now mostly responsible with slime. Except for once last week when, belying all prior instruction and correction, one child got slime on the couch. In an effort to clean it up, she conspired with her sisters, squirted a generous dob of hair conditioner onto the sticky mess, and then scrubbed it with toilet paper which deteriorated and clumped into hundreds of gloppy bits. (Because that's how a child cleans slime.) Then she spoke of it to no one. But, as we all know, messes tend to get found out. I spied the still-damp aftermath later that day and raised the red flag, "Alright, WHO did it?" Even my normally calm and unflappably patient husband had enough. I stood beside him as he railed at the girls, all of whom sat silently on the now-slimed, stained, and conditioned couch. I was angry, playing chords of "Do you have to ruin every single object in this house?" He seemed even angrier, with refrains of "Why didn't you tell us instead of making it worse?" It wasn't pretty. It wasn't the type of atmosphere I want to characterize our household. As the evening wore on, with everyone either bristled or sullen, I thought more about the incident. Yes, our daughter had disobeyed. Yes, she knew it was wrong. And yes, that disobedience made a mess -- a mess that she tried to cover up, nonetheless. But that's where I got stuck. My daughter had known that she'd get in trouble for getting the slime on the couch. So she tried to hide it -- or, more aptly, she tried to fix it. It just so happened that her fix hadn't worked, so she got in trouble for that, too. Darned if you do. Darned if you don't. The Catch-22 made me pause. I thought of some messes I've made in my life. Big messes. Messes with family, or messes with relationships, or messes from poor choices. I know what it's like to want to hide those messes, to cover them up, to speak of them to no one, to hope they'll just go away on their own, and then to languish under their weight because they never really go away on their own. They fester until they're dealt with. Mostly, I thought about how gentle God is when I come to Him with my mess. When I point to the proverbial slime on my couch and admit to God, "I did that. I knew better, but for whatever reason, I still went ahead and did it. Now it's a mess. I'm stuck, and I'm so sorry." When I confess, He forgives me fully. He doesn't make me wallow. When I confess, He frees me. I no longer waste away under the heavy weight of my guilt. During this particular slime incident, though, I had wanted my kids to wallow. I had been ticked off, and rightfully so. They did know better, after all. But it struck me hard -- my reaction and correction had been fueled with anger and passive-aggressive complaints. Contrast that with God, who certainly corrects, but does so with grace. And that's how slime brought it to my knees. That's how slime found me apologizing to my kids for my bad behavior, for my mismanagement of anger, for my mess. Joel and I both approached the girls. We messed up. Your action was wrong, but so was our response. We're sorry. You can come to us with your messes. We're not perfect and we might get upset, but we love you. You're always more important than things. Always. You don't have to hide your messes from us. Even more importantly: You never have to hide your messes from God. He loves you. Unlike us, He is entirely perfect. His response will reflect that perfection. There's freedom when you confess. After all, throughout my walk with Jesus, I've learned that freedom isn't reached by letting enough time pass until I no longer feel the sting of my wrongdoing. It's not achieved by convincing myself that I meant well. It's not accomplished by overcoming with better deeds in the future. It's found by taking ownership and admitting -- to myself, to others, to God -- that I missed the mark and asking for forgiveness, rather than hiding my mess. I go to God regularly with my shortcomings as a parent. On any given day, I feel as if there are endless permutations of ways I'm messing up my children, each time just a bit differently, like a combination lock of dysfunction. I sometimes swing like a pendulum, wondering whether I'm too permissive or too strict, too hand-off or too overbearing, all in the same afternoon. But perhaps this is by design. We parents are going to mess up. Our children are going to make mistakes, too. When I'm honest with my kids about my failures, asking their forgiveness when necessary, we all experience healing. It models for them how to make wrong things right, which might be one of the most valuable lessons they ever learn. So today, if you've made a mess of parenting, don't despair and don't hide. Take it to God. He already knows you did it, and He'll help you to clean it up. 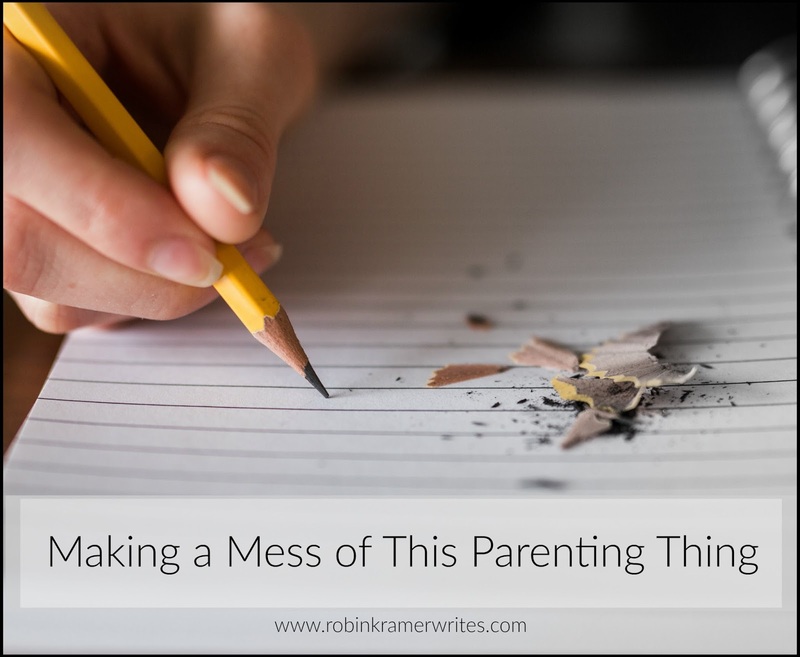 Are you new to Robin Kramer Writes? I'd love for you join me and follow my blog on Facebook. Check out some other popular posts below! Oh Robin - this was absolutely beautiful. It's so important to bring those messes to God (and trust me, I have more than enough of them myself)! Such vital words and encouragement you shared here. Thanks, Jennifer. That means a lot. As a child of the 1980s, I know all too well about play slime on the carpet and/or furniture. My Mom was livid but it was water-based, did not stain permanently, and she eventually forgave me.